Ted Allen, the host of Food Network's Chopped, recently visited Max's school to speak at a luncheon. Max's vocal group did a presentation. I wasn't there, but Max's teacher and a fellow parent both emailed to let me know that in his speech, Ted mentioned that Max had shown everyone there what it is to be "pure joy." I thought that was cool. 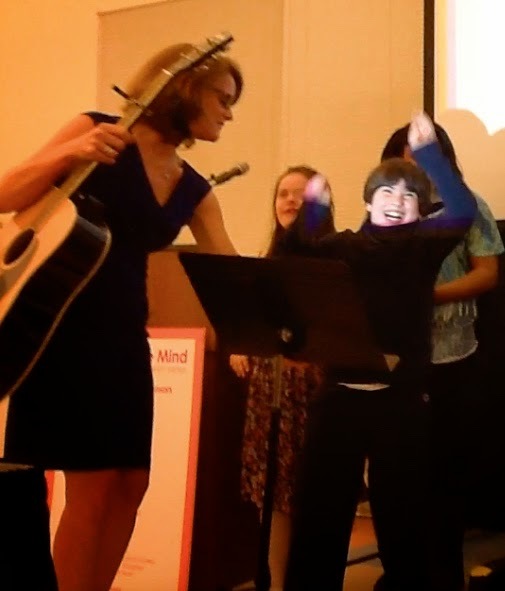 But I also had my usual knee-jerk reaction to comments about Max's happiness: This boy has so much more than joy. It is such a stereotype that kids with special needs are full of happiness, as if it is their one and only asset. Max does happen to have a really cheerful disposition but, as I've said before, his happiness has nothing to do with his special needs. When people who don't know Max categorize him by this trait, it makes me ache for them to notice his other qualities. Perhaps this reaction is hard to understand, especially if you don't have a kid with special needs. It's just that it's all too instinctive for people to define our children this way. It's kind of similar to how some people might describe an overweight person: "She has a good personality!" As if her body isn't worth commenting on. As if my kid isn't otherwise worth commenting on, besides the smile on his face. Being the parent of a kid with special needs means regularly having to prove his worth to the world. But then: Max's teacher sent home a thumb drive with the performance. And, oh my heart, Max was ebullient. He had a Texas-size smile on his face as he sang. He bounced up and down. He just beamed bliss. And when it was done, he took a bow, then another one and then yet another one, looking even more ecstatic. And there was no denying it: Max's joy is his most prominent trait. Ted Allen did have some great impressions of kids at the school. He praised their singing. He commended students for coming up with creative ideas for Chopped baskets (each holds four ingredients that participants on the show use to make their dish). With Max, though, he noticed his joy. As much as I yearn for people to perceive that Max is made up of so much more, that bliss will serve him well in life. And for that, I am grateful. Even through photographs you can see Max is full of joy and true excitement. And to have a celebrity see this joy not as a stereotype but as a true personality trait is pretty darn cool. 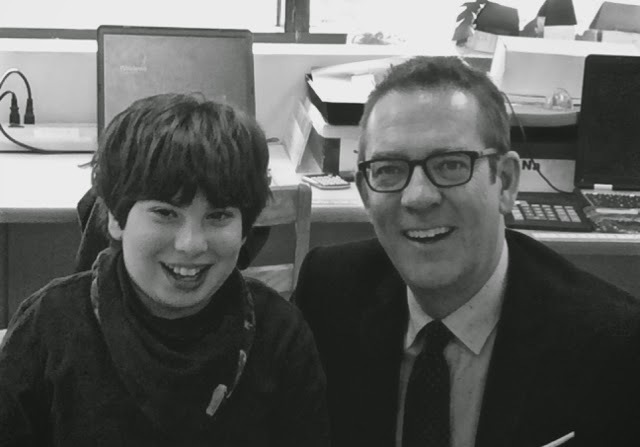 So is the fact Ted Allen visited a school for kids with special needs. I'm jealous! I love watching Chopped. For a Chopped basket, I suggest yuzu, Pan di Stelle cookies, rambutan, and octopus. It's cool that he saw Max's joy as his true personality. I want others to think the same about my creativity, passion, and ambition. That's one combo of food I'd like to see! So, Anna, are you now a fan of Pan di Stella cookies, too? You just reminded me, I'm due for getting a new bag of them from the Italian grocery! I've haven't had them yet, but I'd like to. They sound SO GOOD! Thank you for sharing such a wonderful story and, once again, putting words to the conflict that arises in we parents of children with special needs when well meaning individuals praise our children with these sorts of platitudes. On the flip side, thank you for reminding we parents of children with special needs that sometimes those well meaning individuals are indeed accurately describing our children with those same platitudes. Sometimes we need to be reminded that even though our children are so much more than joy, it does not mean they are not also full of joy. I too a a huge fan of Chopped. J and I watch it often together (that and Cutthroat Kitchen). Instead of a basket suggestion, I would like to see a theme episode where competitors need to also produce a blenderized version of each of their dishes to help raise awareness of feeding tubes. Oh, how cool would that be!!! I've only seen a few episodes, and it was the Canadian edition, but I wonder if they've ever had a chef with special needs or some kind of disability? Surely there have to be chefs out there who do. I wish I could but I can't, AZ, as other kids are in it and I have to respect their privacy.